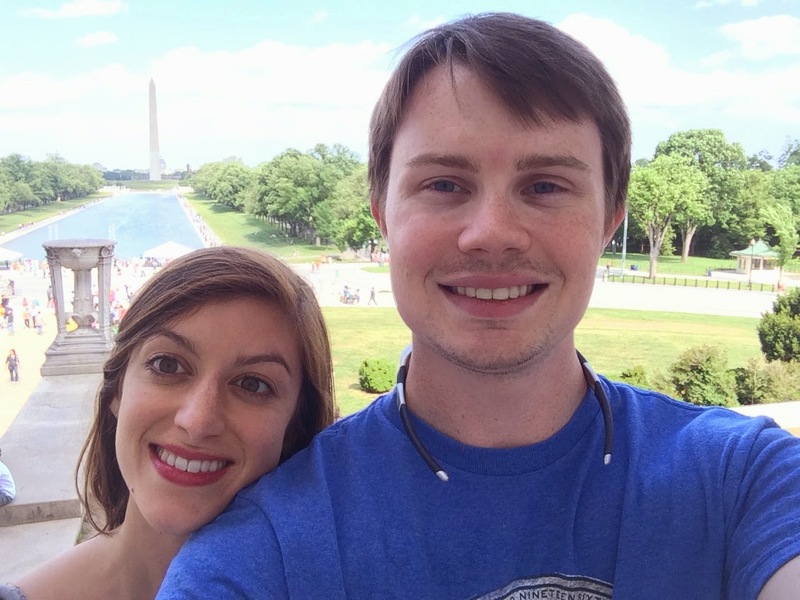 Life & Blog Update: I'm in DC for the Summer! Hi! This is another non-recipe post bringing you a little life and blog update. I'm in D.C. for the summer! This is me freaking out in front of the Supreme Court. I didn't actually get to go inside, but I've been told that Justice Sotomayor lives in my neighborhood and I am totally determined to meet her and become best friends for life. A year ago, I never thought I would be spending my 2L summer in D.C. I had a PLAN, and that plan involved working at a firm in North Carolina that would provide me a job offer at the end of my 2L summer so that Adam and I could plan our lives accordingly. After several rejections from firm jobs, I applied for a federal government job in D.C. on a whim. And I say on a whim, not because I didn't like the job (it's actually kind of my dream combination of law and education) but because I did not want to be away from Adam for the summer or move to a big city. But, as you can probably guess, I never got an offer from a law firm in North Carolina. I got an offer from the dream education law internship in D.C. And, in one of my more terrifying life decisions, I accepted it. The planner in me is still mourning the loss of this life PLAN. It would be really convenient to have the next two years of my life planned out, but I'm trying really hard to remember that there are no guarantees in life--NONE. My current life mantra is to let go of fear and comparison and to embrace uncertainty and hope. To be honest, this blog is at the bottom of the list of my priorities this summer as I attempt to juggle an internship, journal responsibilities, research for a professor, some intense family stuff, and seeing this scruffy man as much as possible. As always, thanks so much for your support of the blog. I'll try to be back with a recipe soon! I cannot get enough strawberries this time of year. After we went strawberry picking a couple weeks ago, my sister gave me two shortcakes she had leftover from a dinner party where she served strawberry shortcakes for dessert. I thought about waiting until the following evening to eat the strawberry shortcakes for dessert, but by the next morning, I could no longer resist their allure. The point of this story is that on Sunday morning, Adam and I had strawberry shortcakes for breakfast. With butter laden shortcakes, real whipped cream, and strawberries perfectly macerated in sugar. Weekend breakfasts are a time to splurge, in my opinion. The problem was that on Monday morning, I was still craving strawberry shortcake for breakfast. If you've been reading for a while, you know that I love baked oatmeal for breakfast because it has helped with my genetic disposition for high cholesterol. Therefore, I needed to create a way to have both oatmeal and strawberry shortcake for breakfast. And that's what I did! Ok, fine, this is not exactly like strawberry shortcake, but it's close enough for me. To tell you the truth, it's a lot more virtuous and filling than the real version but perhaps less aesthetically appealing. The gluten-free honey chia oatcakes, for example, are rather crumbly and homely. 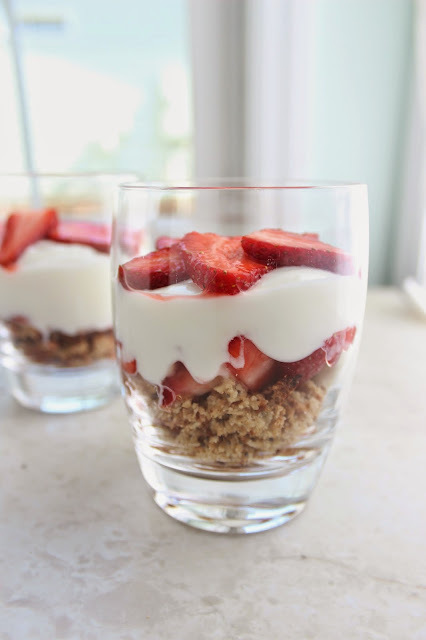 But that's ok, because with these parfaits, we are just going to crumble them up to fill the bottom of a bowl or glass. Also, if you let these shortcake/parfaits sit for a while, the oatcakes will soak up some of the liquid from the yogurt and strawberries and become even more fluffy and cake like. This is an all around healthy-dessert-breakfast win. Try them and let me know what you think! Preheat oven to 400. Line a baking sheet with parchment paper or spray liberally with non-stick cooking spray. In a medium bowl, combine oat flour, oats, chia seeds, baking powder and salt. In a small bowl, whisk together honey, egg, milk, and vanilla extract. Using a pastry blender or two knives, cut the coconut oil into the oat flour mixture until mixture is crumbly. Add milk/egg mixture and stir to combine. Bake at 400 for 10-15 minutes or until golden brown. 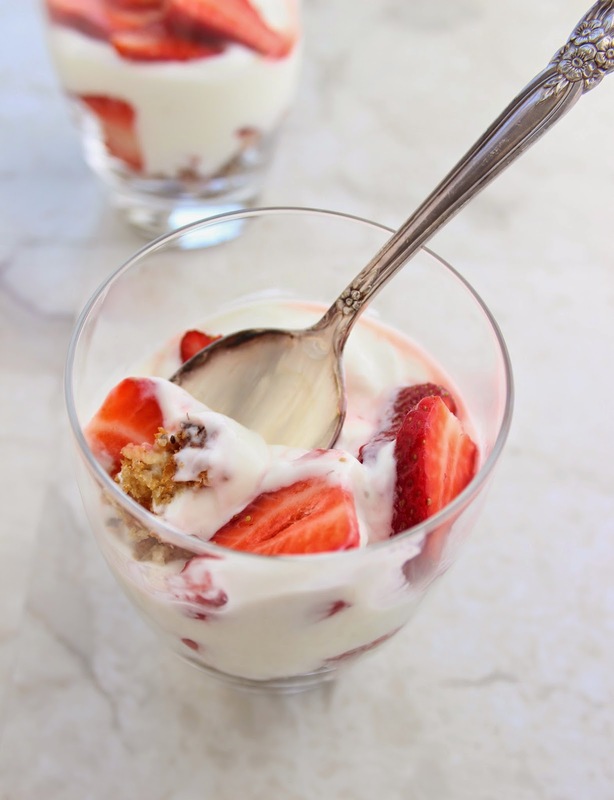 In a medium bowl, combine yogurt, honey and vanilla extract until smooth. Place 1/4 of the strawberry mixture into each of two clear classes. Crumble 2 oatcakes into each glass on top of the strawberries. Dollop on half of the greek yogurt mixture. Evenly distribute the remaining strawberries between the two glasses. Eat immediately, or cover and refrigerate for up to 2 days. Fiesta Fiesta! I wish I'd shared this recipe with you last weekend before Cinco de Mayo, but the truth is, I'd eat Mexican-inspired food any day of the week. This recipe is super easy and super adaptable, and a great way to use up leftovers. 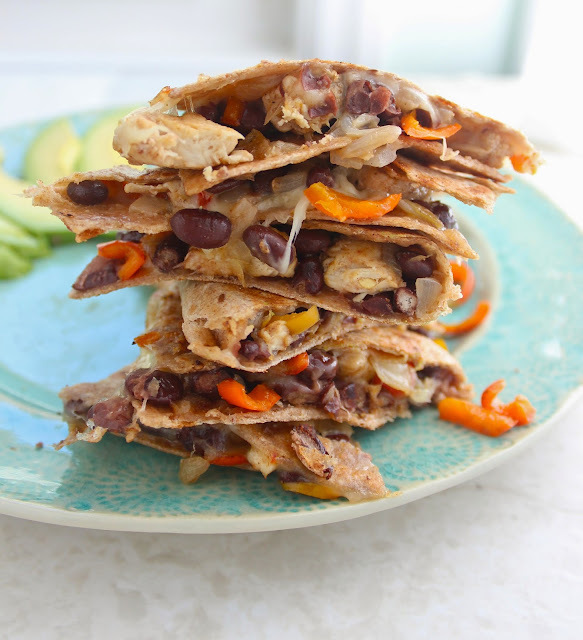 Flour tortillas and shredded cheese can become a vehicle for leftover bits of vegetables, meat, or a can of beans. My favorite cheese for quesadillas, however is pepper jack. It has a little kick and melts really well. 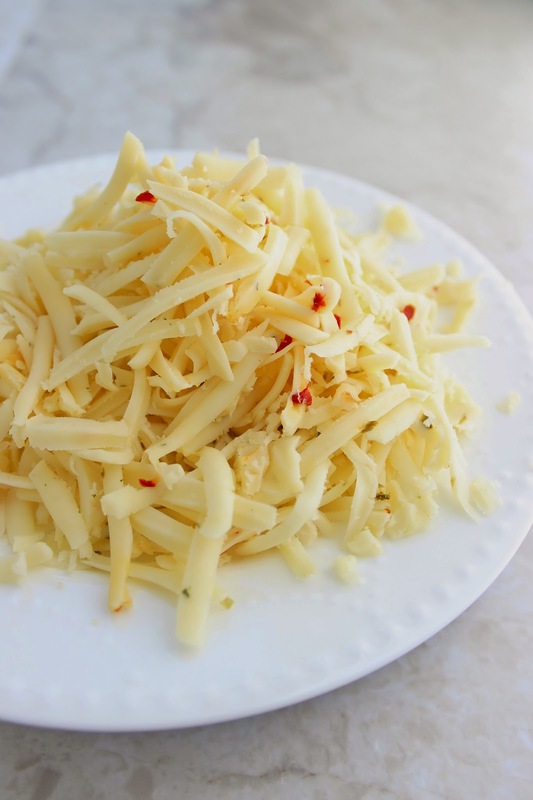 If you can, shred your own cheese. The pre-shredded stuff doesn't melt nearly as well. 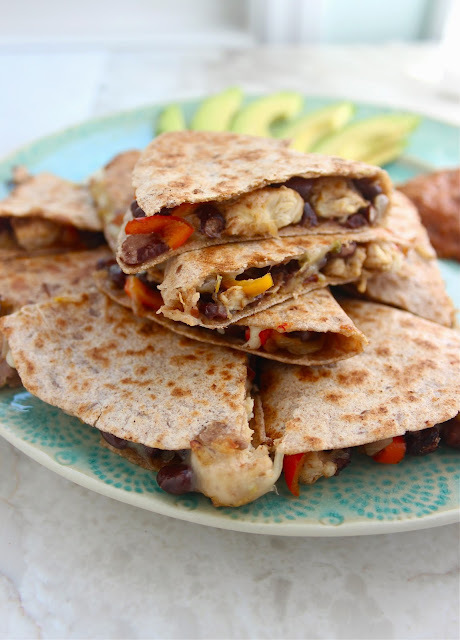 These are fajita quesadillas because of the addition of sautéed onions and peppers. It takes a little extra time to sauté the veggies, but to me, it's worth it for the sweetness and brightness they add. Once the onions and peppers have softened a little, you add zee chicken. Then, you can pour the fajita mixture onto a separate plate and use the same pan to make the quesadillas. Add a little butter or olive oil and then a tortilla. I like to add the cheese first, followed by the fajita mixture. Fold over the other half of the tortilla and cook for a minute or so on each side until browned. You're done! Any leftover quesadillas won't be quite as crispy the next day when reheated in the microwave, but they're still tasty. 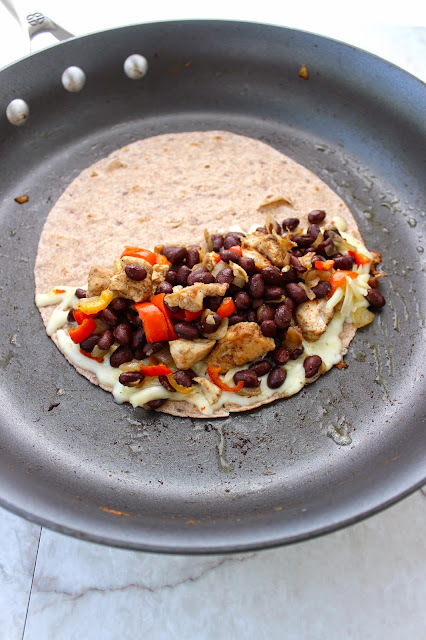 You can also keep the fajita mixture separate and make more quesadillas the following day. Now I'm actually envisioning a breakfast version with scrambled eggs instead of chicken. Endless possibilities! My friend Erin, who guest-posted her crock pot cranberry sauce here a couple months ago, recently wrote an inspiring post on Treble in the Kitchen about how she found a healthier balance with exercise and nutrition after suffering a serious leg injury. Best.news.ever. Cheese as the secret to a longer life and faster metabolism. A deeper look at why we're happy on Fridays and depressed on Mondays. I can't wait to make these waffles. Overwhelmed by the produce section at the grocery store? Check out this May produce guide. So many takeaways from this article. Freshmen year of college is hard. Instagram is not real life! Don't compare your daily life to other people's filtered images on social media. We need more awareness and acceptance around mental illness. Never be afraid to reach out for help. I thought I couldn't love Stephen Colbert any more, but then he did this. Beautiful illustrations of what love looks like. The last image is my favorite. Have a lovely weekend and make some quesadillas! Oh, and give your mom a hug! Add the chicken breasts, 1 tablespoon olive oil, chili powder, cumin, garlic powder, and salt and pepper to a large ziploc bag or plastic container. Set aside to marinate in the fridge for anywhere from 10 minutes to 12 hours. Heat 1 tablespoon olive oil in a large saucepan over medium heat. Add diced onions. Cook for 5-7 minutes or until soft and slightly translucent. Add red and yellow pepper and cook for two minutes more. Meanwhile, remove chicken breasts from marinade and chop into bite-sized pieces. 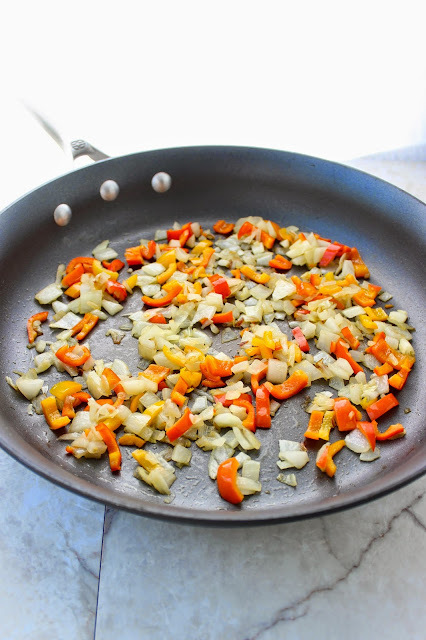 Push onions and peppers to the outer rim of the saucepan. 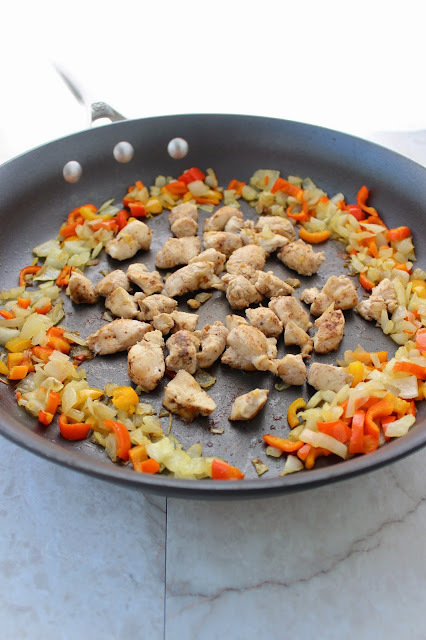 Add chicken to the pan, and a little more olive oil, if needed. Cook chicken for 3-4 minutes or until no longer pink. 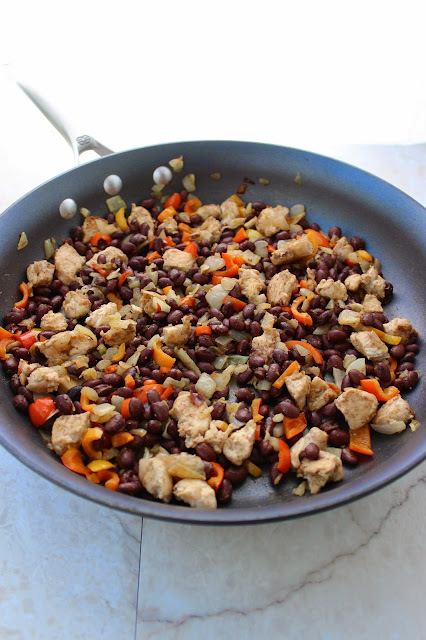 Add beans and cumin to the pan. Cook for another couple minutes, or until beans are heated through. Pour chicken/vegetable/bean mixture onto a separate plate. If there are lots of bit and pieces stuck to the pan, carefully wipe it out with a paper bowl or rag. Otherwise, add another tablespoon of butter or olive oil and bring heat to medium high. Begin by placing a flour tortilla in the pan. Sprinkle a handful of cheese on on half of the tortilla. Then add a spoonful of the chicken/vegetable/bean mixture. Gently fold over the other half of the tortilla. Cook for 1-2 minutes on each side or until tortilla is flecked with brown spots and the cheese is nice and melted. 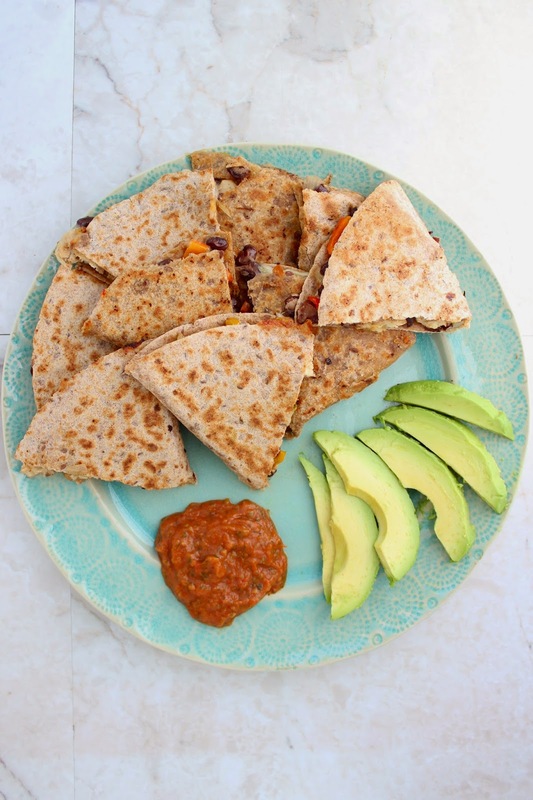 If not serving immediately, keep finished quesadillas warm in a 200 degree oven. The first few days after my last exam over are a weird time for me. Each exam looms large and foreboding in the distance, like an obstacle I just can't see behind. But then, one blessed day, I'm done. DONE. But what now? One day of totally vegging out in front of the t.v. is fine. One day of deep-cleaning my entire house is usually in order too, but then what? I've been longing for free-time all semester, but now that I finally have it, I don't know what to do with myself. I think part of the reason I find this so problematic is that I know I am part of a culture that is plagued by the disease of being busy. I've told myself that my busyness is just an inevitable part of being in law school and that once I'm back in the working world, I'll have more ability to incorporate rest and free-time into my schedule. But here I am with tons of free time, and you know how it makes me feel? Antsy. You know what it makes me want to do? Plan things. W.B. Yeats once wrote that "it takes more courage to examine the dark corners of your soul than it does for a soldier to fight on a battlefield." This is why we like being busy. Busyness distracts us from the unanswered questions in our heart, the nagging doubts about a decision we made, the guilt we feel about letting a friendship slip away. Those thoughts are starting to slip in for me now, mostly in the form of uncertainty about what happens when I graduate next year. In a couple weeks, I will be back to routine and busyness, but in the meantime, I am going to do my best to sit with the uncomfortableness and the angst, to FEEL all the feelings and THINK all the thoughts. But, I'll also be drinking lots of wine and making lots of fun recipes for you guys, so there's that. 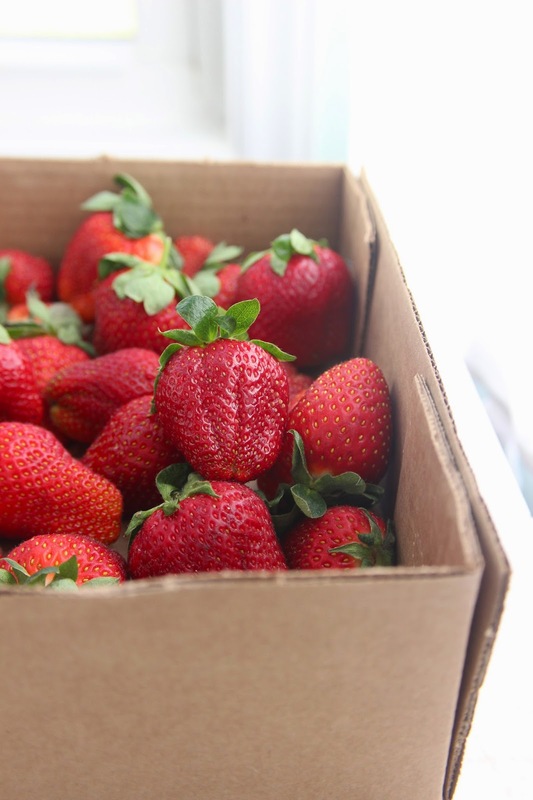 Late spring/early summer is the prime time for strawberries in North Carolina. For the past two years, I've gone strawberry picking in May and then made you a strawberry-inspired recipe. Two years ago it was strawberry banana walnut bread. Last year it was strawberry pretzel cheesecake. 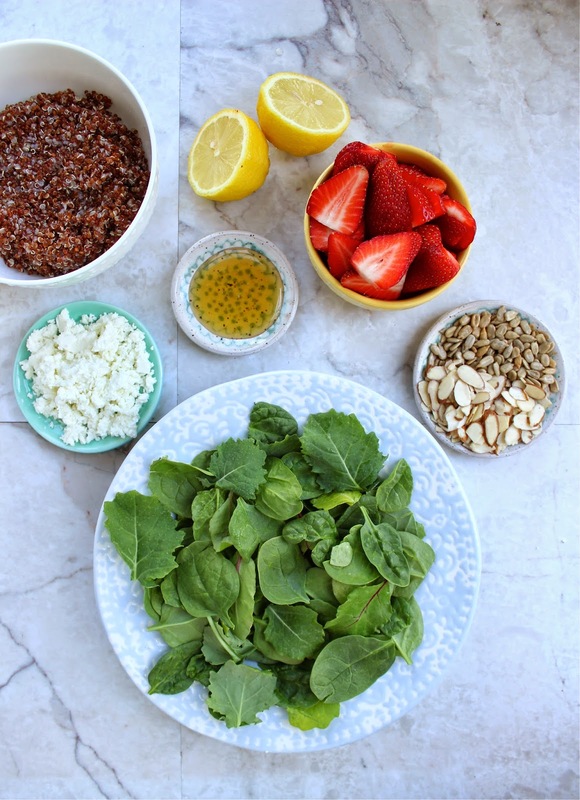 This year I'm going a little healthier with this spinach strawberry salad with coconut quinoa and honey lemon dressing. I was aspiring to make a filling lunch salad with this recipe. 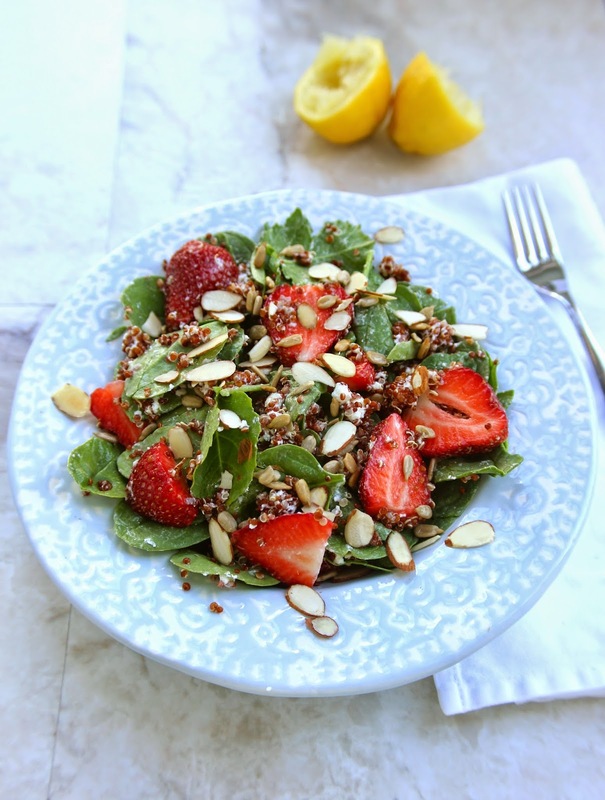 I love a simple side salad with spinach, strawberries and almonds, but if a salad is going to encompass my whole meal, I need some cheese and some protein. Enter the goat cheese and the quinoa. 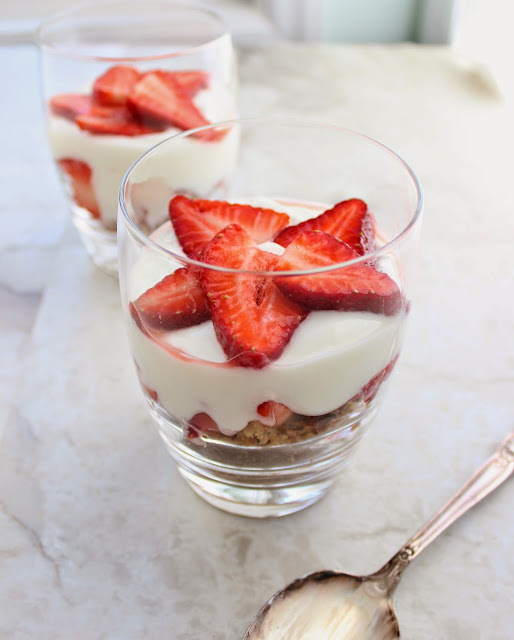 The tangy goat cheese pairs well with the sweetness of the strawberries, and the quinoa is amped up in both flavor and richness by the presence of the coconut milk. This salad is filling, healthy, delicious, and just plain beautiful. It's going to be my sustenance during this period of rest and reflection. Strawberries totally have superpowers, right? 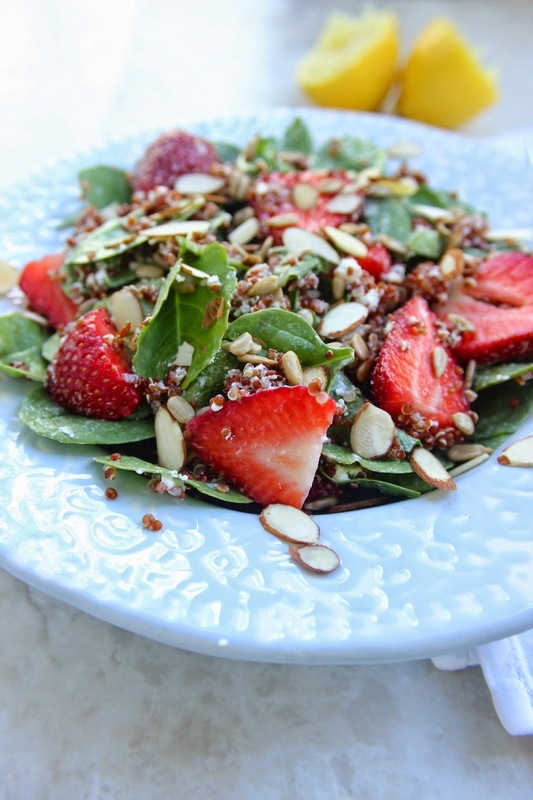 In a large bowl, combine spinach, sliced strawberries, quinoa and goat cheese. Drizzle in some of the honey lemon dressing. Toss salad together and place in bowls or plates. Sprinkle with almonds and sunflower seeds. Whisk together all ingredients. Serve immediately or cover and refrigerate for later use. All together, this recipe serves 4-5 people. Feel free to reserve extra quinoa, goat these, and honey lemon dressing in the fridge.